When searching for wedding rings, one thing many women prefer is a matched set. This means that the wedding band is a perfect match for her engagement ring. Often times, though, a woman’s engagement ring does not have a direct match. In these cases, it is necessary to have a custom wedding band made. Not only will this wedding ring be the perfect pair to the diamond engagement ring, it will also prevent damage to either ring. Since both the wedding band and engagement ring are a matched set, they nestle together without creating friction damage. If your engagement ring has a matching wedding ring, then find the right matching wedding bands for your ring is no sweat. 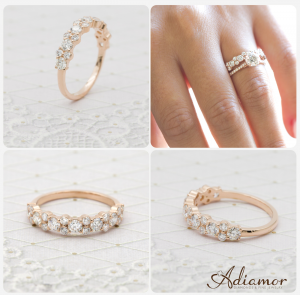 However, just because Adiamor carries the matching band does not mean it can’t be customized to your tastes. Our expert designers and certified gemologists work together to create beautiful wedding jewelry, but we understand the desire for something unique. We can take one of our existing women’s wedding bands and customize it. Whether you’d like to add diamonds or change the ring metal, we can create the perfect matching wedding band for your engagement ring. A customized matching wedding band for our French cut basket setting. Over the years, we’ve created thousands of engagement rings for our customers. One of our most popular items, though, is offering the ability to design your own engagement ring from scratch. By selecting a diamond and an engagement setting from our collection, we customize an engagement ring just for you. However, we can also create customized wedding bands. If we already have a wedding band you like, we can modify it to your needs. Even if you purchased your engagement ring elsewhere, we can create something unique that matches. There are two ways to contact us about customized wedding bands. The most direct option is to call an Adiamor customer service representative at (877) 627-5094. One of our experienced reps will walk you through the process of creating a custom band. Another way to is to fill out our online form for custom rings. Then we will contact you to start the design process.